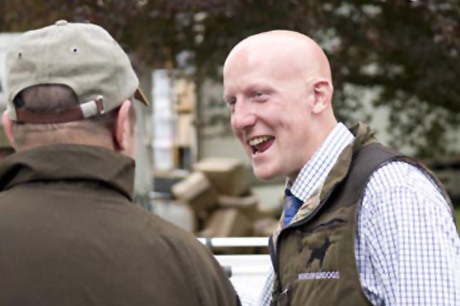 Founder, Charlie Thorburn was born into an Army family, coming to Scotland age 3. Having always being surrounded by family pet and gun dogs, they're in his blood. His first pet dog he really bonded with was a Springer Spaniel, ‘Seiko’, she was not a gundog and slept on his bed every night and the two grew up together and were hard to separate. She passed away the year Charlie went to university at the grand old age of fourteen. While at University Charlie would go shooting with a friend who had a little cocker. Probably described best as wilful, but wonderful little dog with the heart of a lion. The sight of this little dog bustling about doing its job was inspiring however the constant blowing of whistles was less inspiring. Having lost ‘Seiko’ Charlie persuaded his parents to let him buy an eighteen-month-old ‘’trained’’ Springer Spaniel called Moss. He was at his very first formal shoot beating with his new spaniel at heel on a lead. The first drive started and ‘Moss’ was released… ‘Moss’ was caught after nearly ruining the drive. Completely devastated and not knowing where to look or what to do Charlie had had an important lesson that drove him to learn as much about gundog training as possible. Hours spent watching videos, reading books, seeking advice, asking questions, watching other gundog trainers and handlers. Leaving aside the advice not wanted, keeping some, and a great deal of trial and error until he developed the Mordor Gundog way. Moss was used as the guinea pig to develop this method and within a year both dog and master were back at the same shoot… all went well. That day many guns and beaters all commented on Moss with the odd mention of that wild dog from the year before… what people do not know will not hurt them! 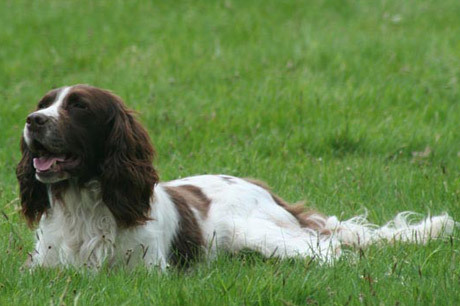 Having enjoyed the experience of retraining Moss so much, a second dog Jasper (a working cocker spaniel) was bought. At the same time a friend asked if he would also train their dog. This rolled on, and as more friends and acquaintances sent their dogs to him while he was still working full time. 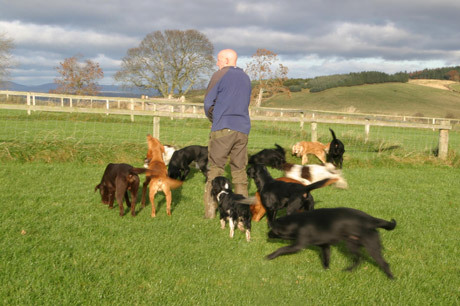 One morning waking and realising he had thirty dogs in his control he started to concentrate to work full time with the dogs, so Mordor Gundogs came into being. Having previously run the business from a friends backyard, the pet and gun dogs are now housed in high quality, purpose-built kennels that more than meet the standards set by the professional kenneling authorities. Built in 2006 and with underground drainage and overhead heating we pride ourselves on keeping the dogs in the highest standard of accommodation. "Marmite is settling in a treat - the way she acts you’d think she’s been here for years. We’ve had no problems with her discipline whatsoever, nor has she messed indoors. She knows exactly what you’re asking her to do usually before you even ask her. I still can’t believe how lovely her nature is. She’s never happier than when she’s up to her belly in gorse and swamp, which is great fun until she gets back in the house and fancies a snooze on the sofa! Just thought I’d say thanks for selling her to us as were getting endless pleasure from her, which is down to the way you’ve brought her up. Anyone whose seen her is amazed at her intelligence, obedience and good nature. Thanks again!"